Hrithik Roshan Tanned for Kites (& Barbara Mori)! Here is little biology about Hrithik Roshan & Barbara Mori Chemistry in upcoming movie Kites. Do they miss the kiss? Will their love scene be hot? Well no one can confirm on this, but looks like Duggu beta is all decked up for hottie Barbara.Â ‘On the Sets’ visuals of ‘Kites’ have leaked on the web. 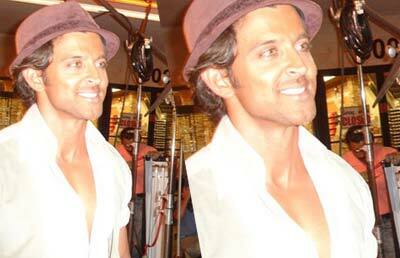 This show Hrithik in aÂ tanned look sporting a hat. Now this for sure is sizzling indication for probable hot sequence between Hrithik and Barbara. What say people?